Per the “American College of Physicians – American Society of Internal Medicine,” Doctors of Internal medicine (also called “internists”) are doctors that treat adults. These physicians are specialists concerned with all aspects of adult (over age 18) medicine, excluding surgery and advanced gynecology. An internist’s concerns include arthritis, hypertension, heart and lung disease, diabetes and thyroid disorders, stress, obesity, as well as just about any other adult illness. What Special Training Is Required? 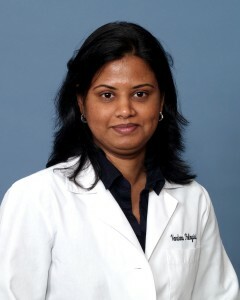 Dr.Vandana Palagiri completed her residency in internal medicine at St. Agnes hospital, Baltimore, MD in 2011. Since then she has gained wide range of experience working at various hospitals including Reston hospital center, private practices, rehab centers, and assisted living facilities. She has privileges at Reston hospital center and Inova Loudoun hospital. If you or your loved one is sick she can closely work with hospital physicians, inpatient rehabilitation facilities, or home health care agencies for a better transition of care. Dr. Vandana Palagiri is committed to giving the best care and establishing long-lasting relationships with patients. She is consistently precise and thorough during consultations. She is attentive to patient concerns and thoroughly explains her treatment plans to accommodate their individual needs and comfort. She has gained expertise in acute, chronic, preventive health, and women’s health in particular. She has expertise in management of chronic medical problems like diabetes, hypertension, asthma, COPD. She has gained vast experience in management of elderly patients with multiple chronic medical issues and ensures timely medical care is delivered to this subset of population.